Sue said yesterday, "Good heavens, you're really going fast on this one. Hopefully that's cos you're enjoying it, not cos you hate it and just want it finished." No worries on that score, I'm steaming ahead because I'm having such a great time and just loving what I am producing from Sue's design. Hurrah! In fact, it is so tempting to carry on, even when I'm at the end of my concentration span that I've had to learn to set a realistically achievable goal for each session and then do no more as know that pressing on after this point will only lead to mistakes and a session with Percy Unpicker next time round. 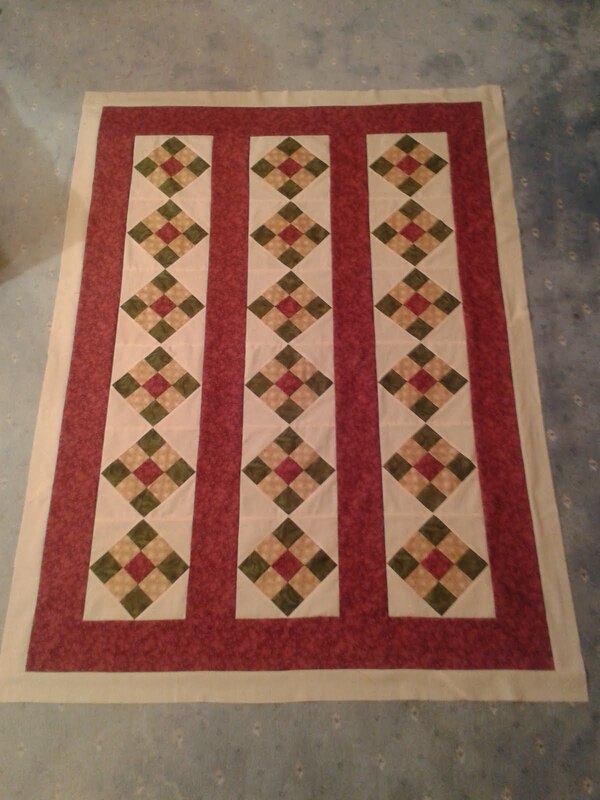 Next step, taking the top round to mum's tomorrow and measuring in situ to see how wide the final red border needs to be. Looking forward to that! It looks great. I hope your mother's happy with it? The colours are fantastic, especially the warm, raspberry-reddy colour. Do factor in the effect of quilting if you are aiming for the finished quilt to be super-accurately-fitted on Mum's bed, any quilting causes the top to shrink slightly. 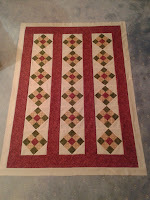 OK, you are never likely to quilt as heavily as I would, but the more you quilt, the smaller the finished item becomes. Oh, I love this more and more each step! Great job!!! Mum's delighted with it, Sue - which is just as well as she's been wielding the debit card to pay for it all! Good advice, Bilbo - so now I've built in some extra width/length so I can quilt to my heart's content without worrying about shrinking - and I can cut off any extra when I can see how the quilting is affecting the size. Well done, Santa - I think the hardest thing will be to chose where to start, Mrs P!